Greetings again from New Jersey. 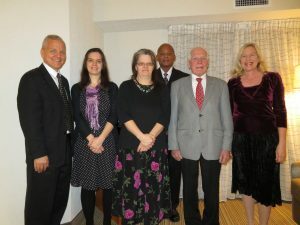 We met with a few supporters in Wayne, New Jersey last Sabbath. On Monday, I conducted funeral services for my mother-in-law, Johanna. Prior to that, I had to spend a fair amount of time rewriting our funeral outline as it was not quite appropriate for someone who was not part of a Church of God group. But that rewriting also gave me ideas for our existing outline–so now we have two outlines depending on whether or not the deceased was part of a COG group. We are scheduled to fly back to California today. Last Thursday afternoon, I was on the radio on the NutriMedical Report with Dr. Bill Deagle. We discussed Europe’s proposed office to prosecute financial crimes and 666. The Blood Moon eclipse peaked in the morning hours of Monday, January 21, here in the UK. For a period of 62 minutes starting just before 5am GMT, the Full Moon turned an ominous red colour in the Earth’s shadow. Some Christian conspiracy theorists saw this as a prophetic fulfilment of biblical prophecy. The Blood Moon was dubbed a “harbinger of the Apocalypse”, a “prophetic sign for America” and “evidence of Jesus Christ’s Second Coming”. The Blood Moon was linked to a number of prophecies foretold by the Book of Revelation, Book of Acts and Book of Joel. And yet despite these doomsday warnings, the Blood Moon passed through nightside totality without kick-starting the end times. Dr. Bob Thiel, a biblical prophecy expert from the Continuing Church of God, told Express.co.uk there was no basis in scripture to truly consider the January Blood Moon a prophetic sign. The preacher previously argued the January Super Blood Wolf Moon “is not a special message from God”. His reasoning for this is a number of events which will have to precede and follow the Moon turning red in order for Revelation prophecy to come true. The preacher has now said some of the events outlined in the Bible are occurring at this very moment but it is unclear where these are headed. In particular, Mark 13:5-8, 37 reads: “And Jesus, answering them, began to say: ‘Take heed that no one deceives you. For many will come in My name, saying, ‘I am He,’ and will deceive many. “‘But when you hear of wars and rumours of wars, do not be troubled; for such things must happen, but the end is not yet. “‘For nation will rise against nation, and kingdom against kingdom. And there will be earthquakes in various places, and there will be famines and troubles. According to Dr Thiel, the “sorrows” are happening now but there are many other examples of scripture which also need to be fulfilled. Dr Thiel said: “For example, some nation will become highly indebted before the Great Tribulation – Habakkuk 2:6. This is happening to the USA. “Damascus will be destroyed – Isaiah 17:1 – and great military damage will hit Jerusalem – Isaiah 22:8-9. The timing of these two events possibly occur before a prophesied peace deal. “One of the most important events to watch for is when the ‘peace’ deal of Daniel 9:27 is confirmed. Deals have been proposed, but the biblical one has not yet been made nor confirmed. Another prophetic sign to look out for is the return of animal sacrifices, as outlined in Daniel 9:27. Dr Thiel also said the world will only come to pass after all apocalyptic signs are fulfilled and the period of Great Tribulations starts. After the Great Tribulation, the sixth seal will open which is when the Moon will turn into blood – could it be the Blood Moon? Soon after, the seventh seal in Revelation will open and usher in trumpet blasts and cataclysm. Dr Thiel said: “The crashing of Wormwood into the Earth will occur after the third trumpet blast – Revelation 8:10-11. Some might call this Planet X hitting the Earth. “The gathering for Armageddon will begin related to the sixth trumpet blast – Revelation 8:13-19; 16:12-16. “Then at the seventh trumpet – Revelation 11:15 – Jesus will return to establish the millennial kingdom. As I have been saying for over a decade, I believe that getting media coverage will be a factor in the final fulfillment of Matthew 24:14. Specifically, I have taught that our teachings about the King of the North (who will promise a human utopia, and not the Kingdom of God as what is need) will generate coverage. The fact that we are getting coverage now (radio and sometimes the press) is consistent with that. I now take this moment to share you my greetings with my fellow church members. I then inform you that since last year December we have managed to spread the gospel good news in the entire Rift valley,Kenya. We are striving to get the gospel, including the truth about God’s church, to all areas we can, including the Rift Valley of Kenya. Brexit and policies of the Trump Administration are getting more in Europe to conclude that they essentially have been abandoned/betrayed by the USA and UK (see Europe feels betrayed by UK and USA: This will not end well). The UK hopes to not extend, but renegotiate Brexit (see UK’s Parliament votes to not extend Brexit & PM May wants EU to renegotiate Brexit issues; EU not pleased), Europe will remember issues from the USA and UK and will eventually rise up against them. The situation in Venezuela continues to boil and we should expect to see changes there (see Venezuela’s crisis, Trump, and ICG). Sermonette, which for most who receive this letter via email will be a recorded one. The one suggested for this week is: Sorry state of the 2020 presidential campaign. Other sermonettes are available at the Bible News Prophecy channel. Sermon, which for most who receive this letter via email will be a recorded one. The one suggested for this week is: The Smyrna Church Era. Other sermons are also available at the ContinuingCOG channel. Other sermons are also available at the ContinuingCOG channel. Brethren, we who know the love of Christ ultimately will be filled with the fullness of God. What an incredible future waits in store for those who truly love and obey God.